Last weekend I took a day off and had a long weekend in Schull, West Cork. While the weather wasn’t the best (of course it would rain on the day I took off), we still had a great time chilling out, eating, reading and watching movies. 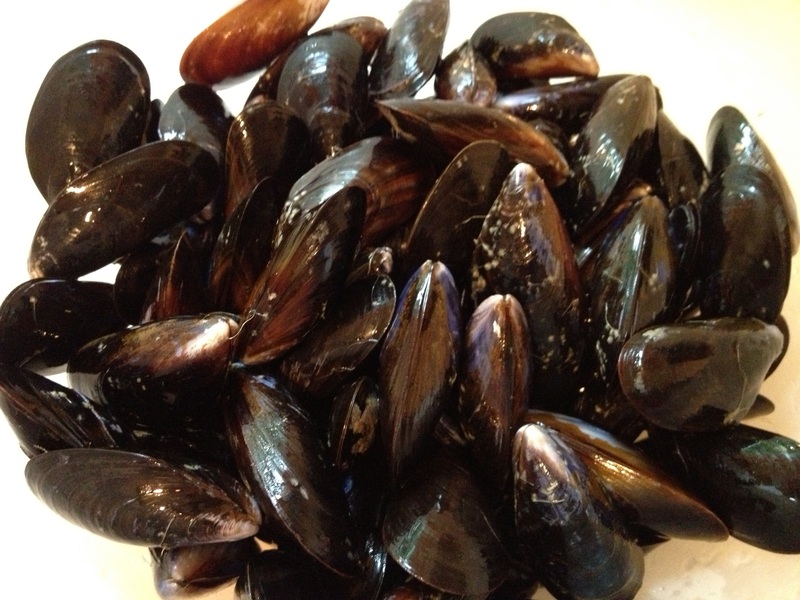 On Friday night we decided to make the most of the great fish shop on the main street and buy a big bag of mussels. 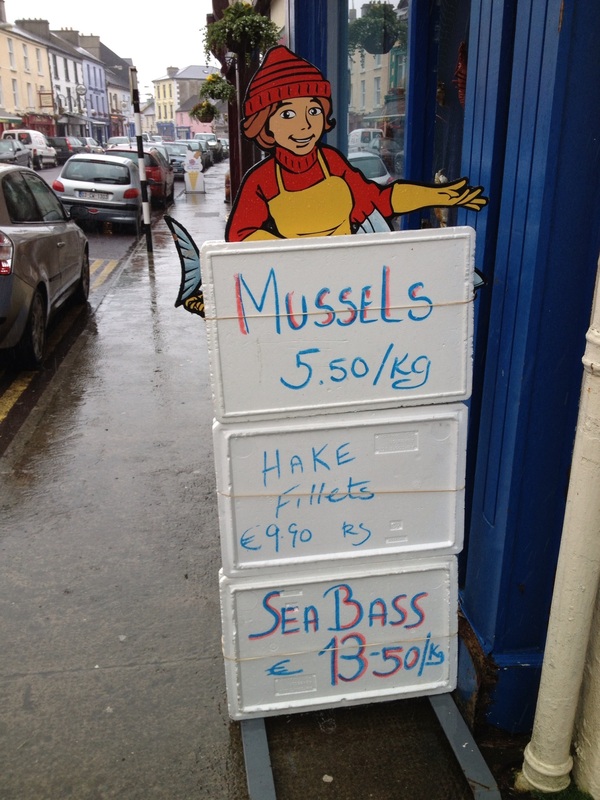 We often get them when we’re down there as the fish is so fresh and only has a short journey of a couple hundred yards from the pier to the main street. She Makes It So Appealing! 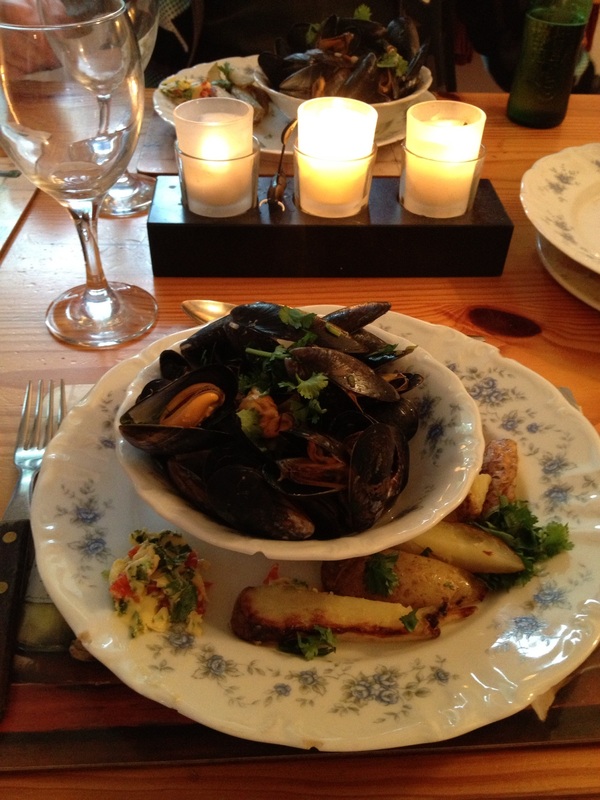 Mussels are extremely quick and easy to make, but a lot of people avoid making them as they perceive them to be awkward to prepare which couldn’t be further from the truth. 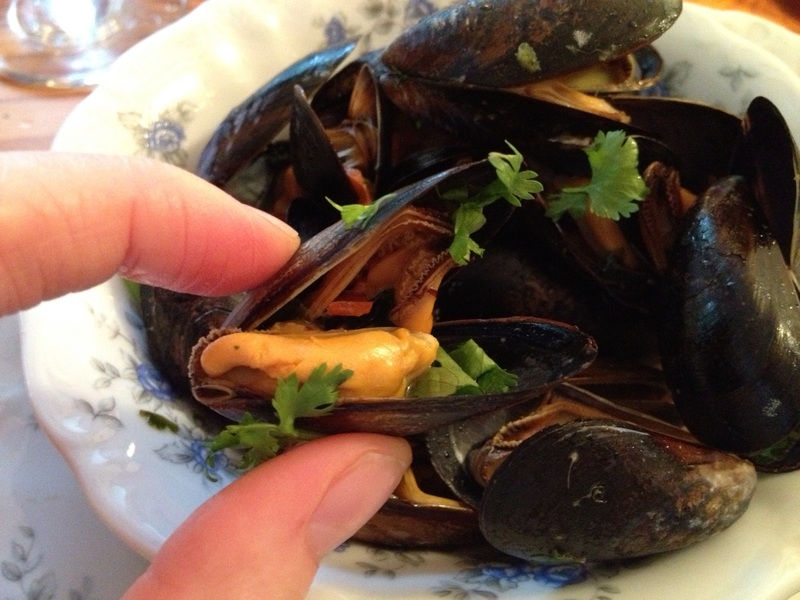 I made and blogged Moules Marinere last year from Schull, but this time I decided to give it an oriental twist to warm and cheer us up with fresh chilli, lime juice and coriander. It worked really well and took no time at all to make. 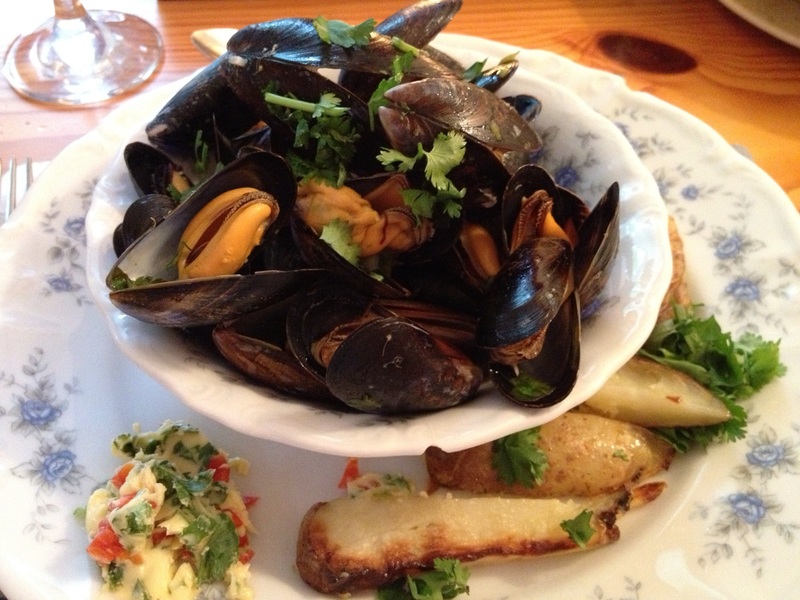 We had chips with our mussels and ate them with the seasoned chili, lime and coriander butter we cooked the mussels in. It make sounds a bit strange having butter on your chips, but honestly if you try this you won’t regret it… Plus it means you don’t have to make a separate sauce, and who can say no to one less job in the kitchen? You will have a good bit of butter left over- I used a teaspoon of mine the next day on a piece of pan fried seabass, you could also use it as a seasoning on a steak or chicken breast. You could also use it in sandwiches, or on baked potatoes etc. 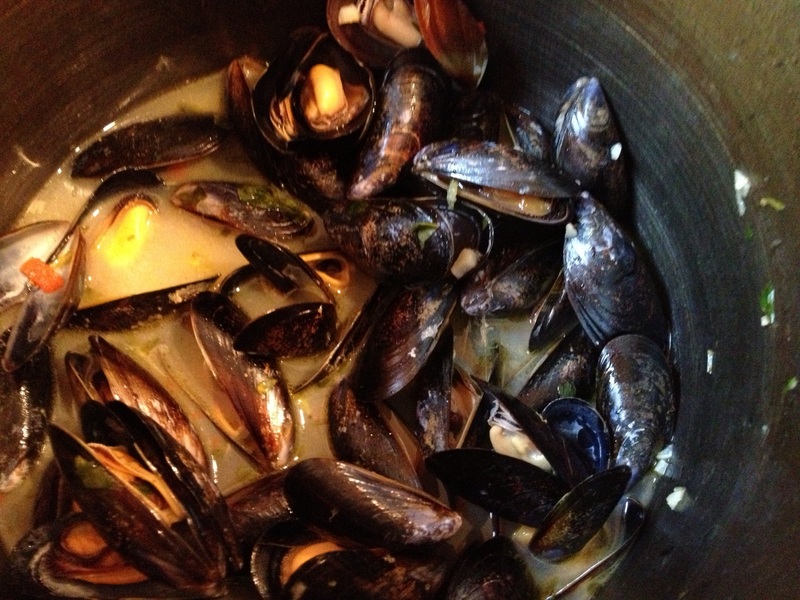 You will also have liquid left over the mussel pot, this would be the perfect base for a fishy soup, stew or chowder. You can freeze this if you don’t need it straight away. 1.. 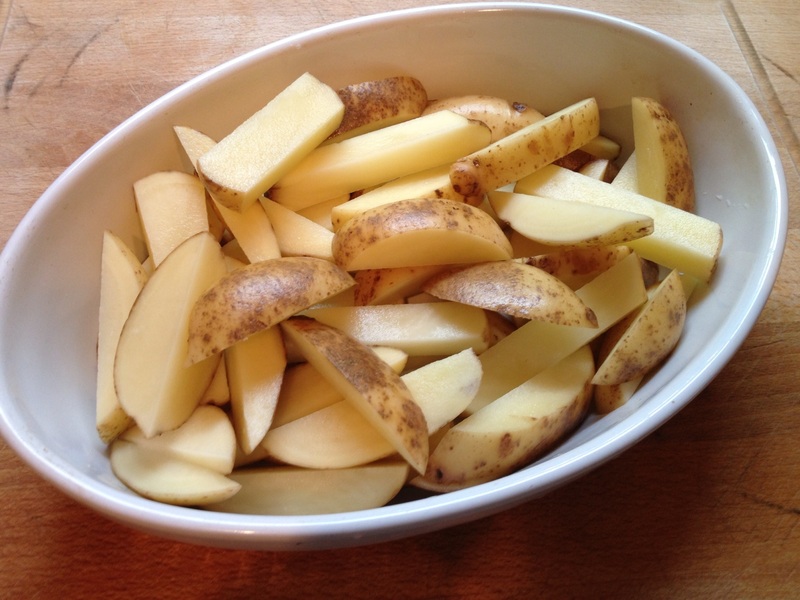 Put the chopped potatoes in a large oven proof dish and coat with the olive oil. Put them in an oven at 190C stirring/shaking every 10 minutes to ensure cooked evenly. These will take about 40-50 minutes. 2.Scrub mussels removing any dirt. If any are open at this point, throw them out. (If any are closed after cooking, throw them out too). 3. 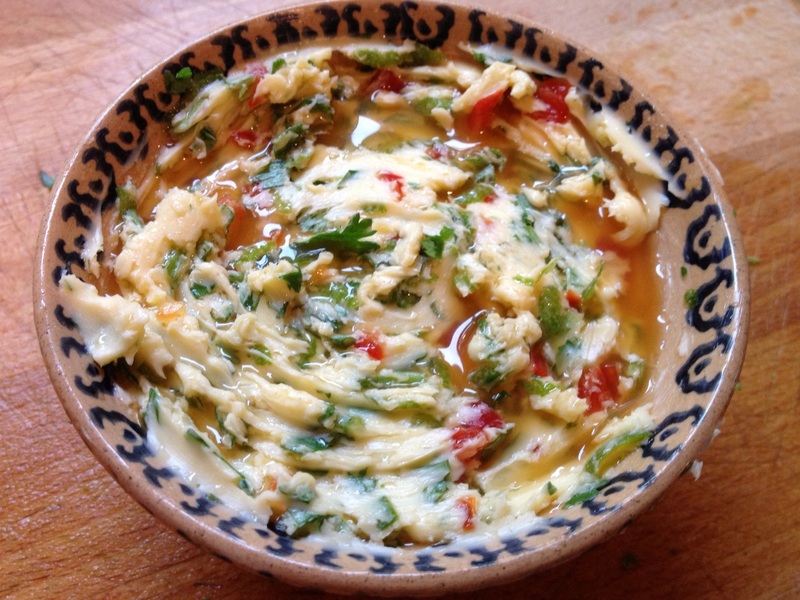 Throw about 25g of the coriander butter into a large deep pot and add the garlic and let it simmer for a minute or two. Add the wine and let the alcohol cook off for 2 minutes. 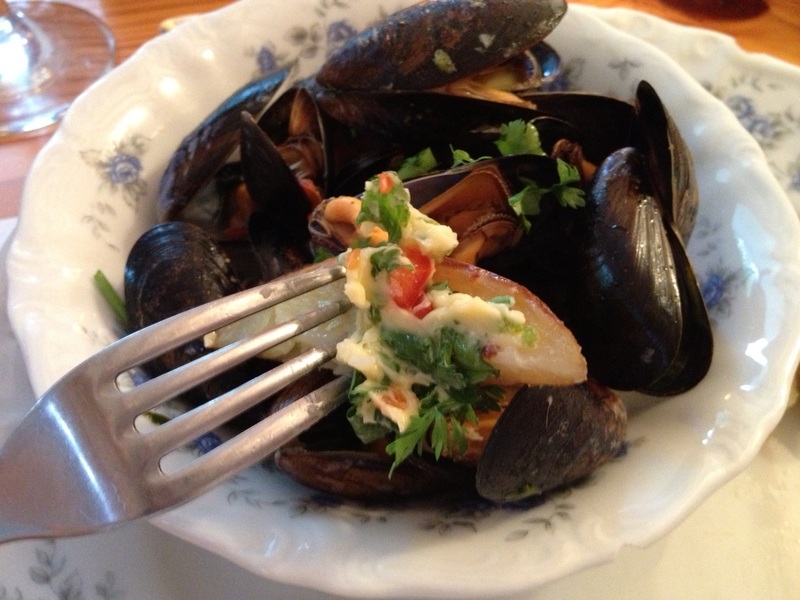 Add the juice of 1 lime and add in the mussels, put the lid on the pot. Stir every 30 seconds with a ladle. These will take only 2-3 minutes to cook, they are done when all the shells are open. Butter On Chips… Feels So Wrong… Tastes So Right…. A lazy brunch on Saturday mornings. Is there anything better? 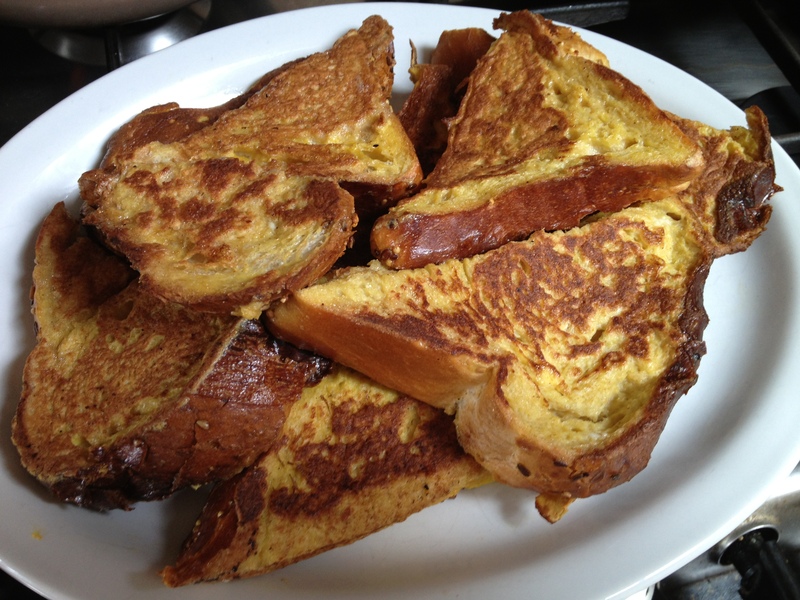 Despite this being one of my favourite brunch dishes, I haven’t put up this recipe on my blog over the last year as French Toast is one of those things everyone knows how to make, and no-one needs a recipe for. However, the other side of me feels that I love eating this so much when making brunch for people, that it should be up on my blog! 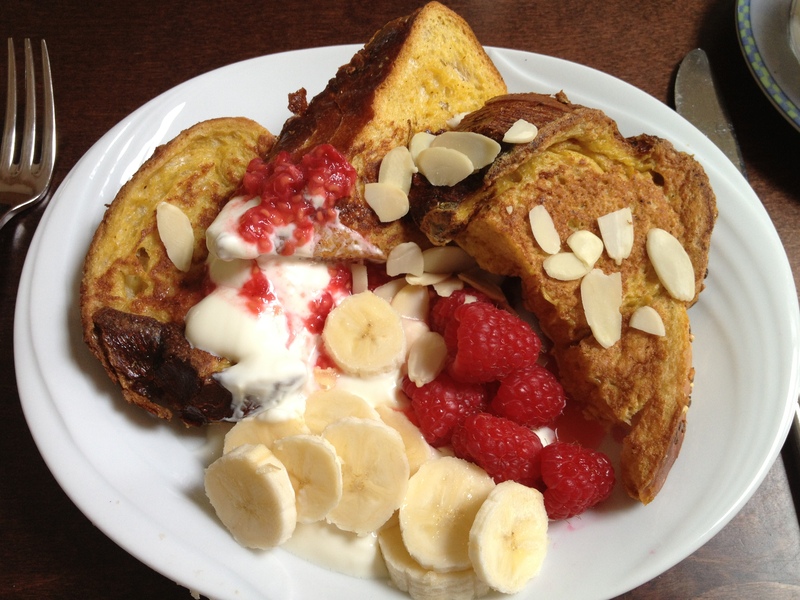 So up it goes along with all my other favourite breakfast dishes. 1. 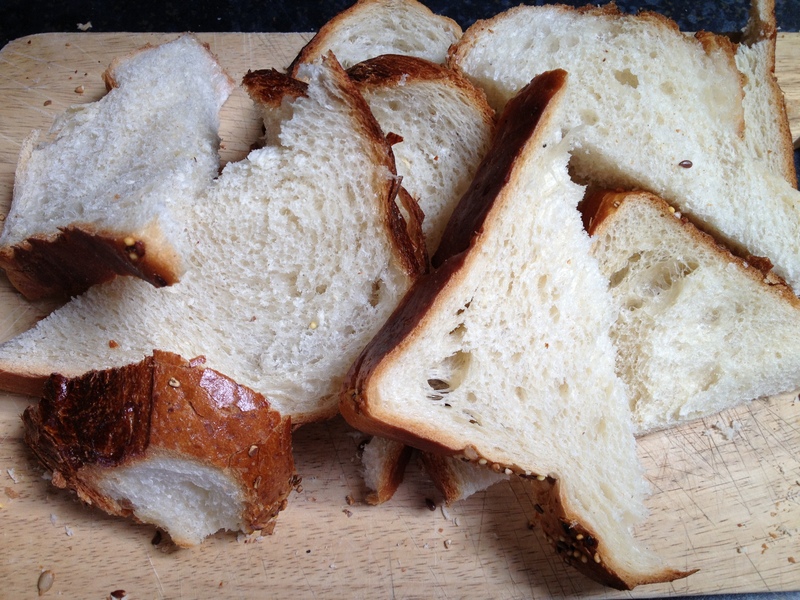 Slice the bread thickly. 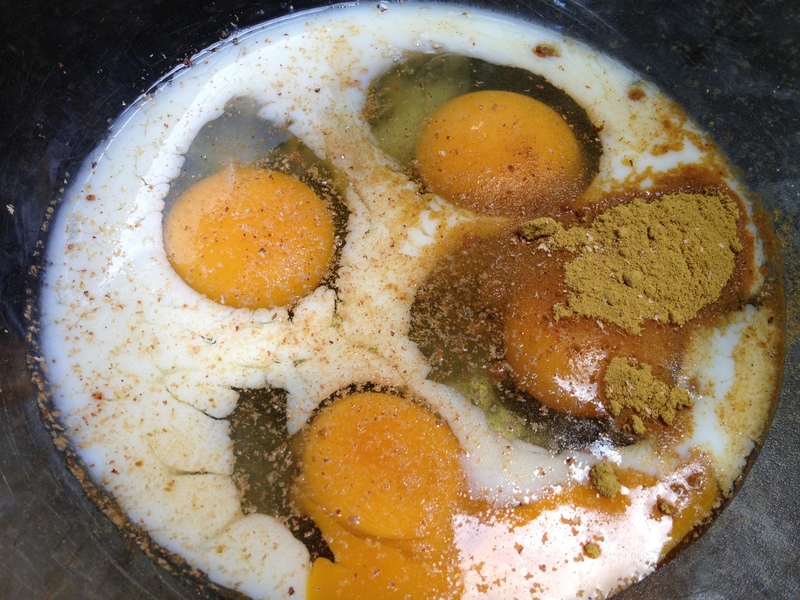 Beat together the eggs, a dash of milk and the ginger and nutmeg. 2. 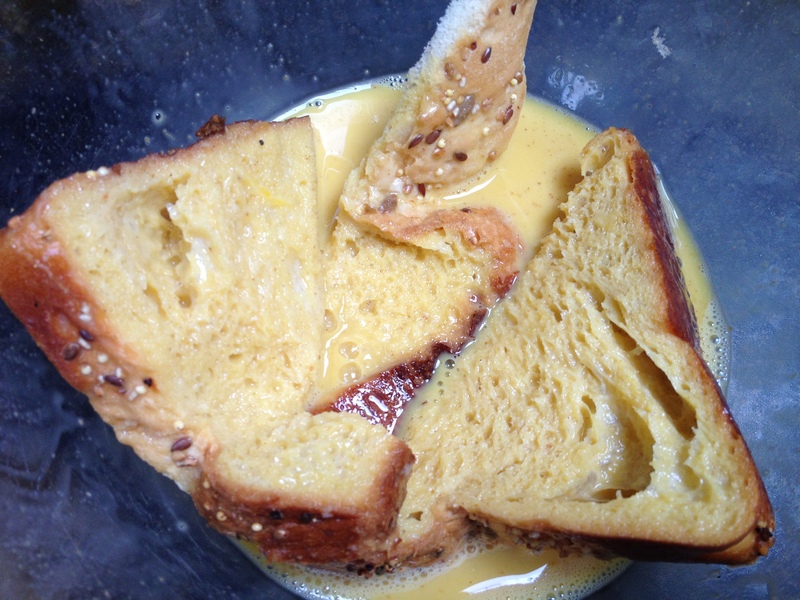 Dip the bread in the egg mix and place on a hot pan that you have melted a little knob of butter in. 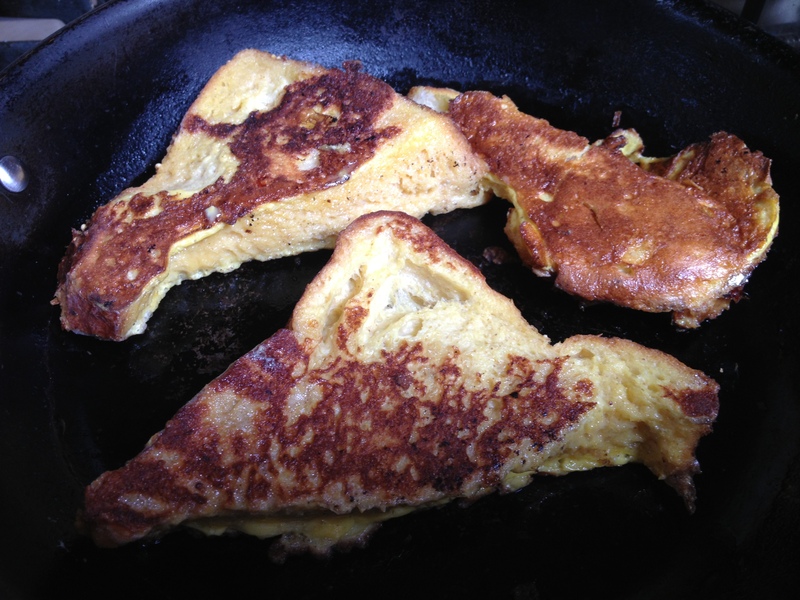 Flip when golden underneath, and when golden on both sides, pop onto a plate and place in a warm oven while you fry the rest of the french toast. 3. Mash half of the raspberries and stir in the juice of half a freshly squeezed orange until it’s fully mixed in. 4. 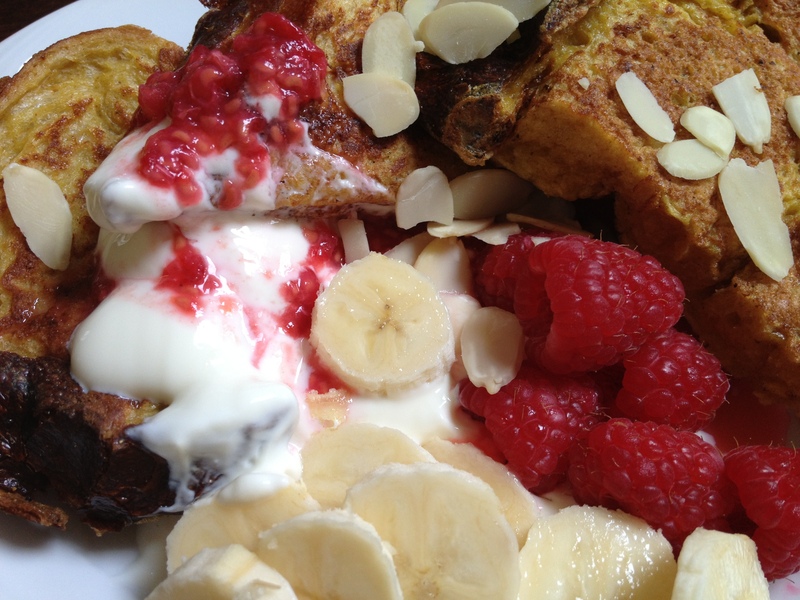 Serve the french toast with a large dollop of Greek yoghurt, the raspberry coulis and garnish with the remaining raspberries, some chopped banana and flaked almonds. This delicious quiche was born out of me trying to empty my fridge. 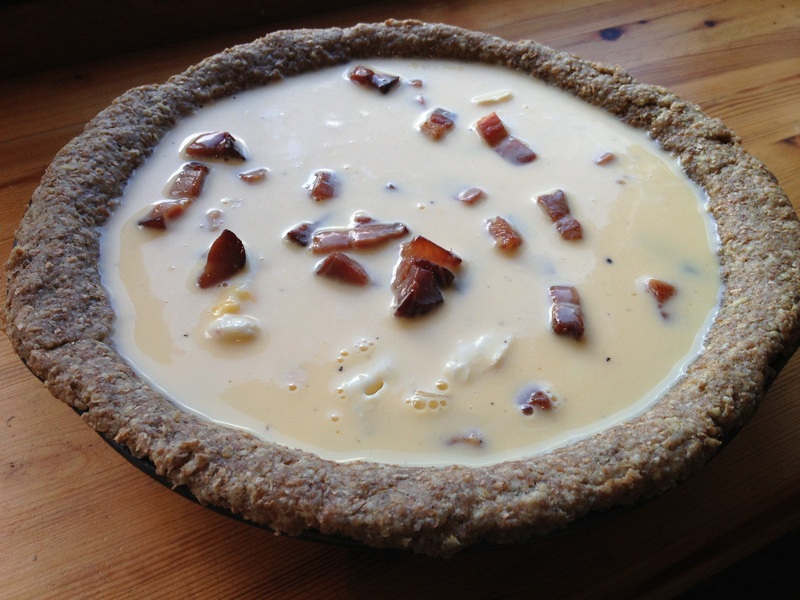 With a few wedges of delicious oozy reblochon cheese sitting in the fridge, and some Ed Hick pancetta that needed to be used up, I decided to make a quiche as I hadn’t made one in ages and had a craving for something comforting. I also thought it would be handy to bring a slice in a cooler bag to the park the following day for a picnic. 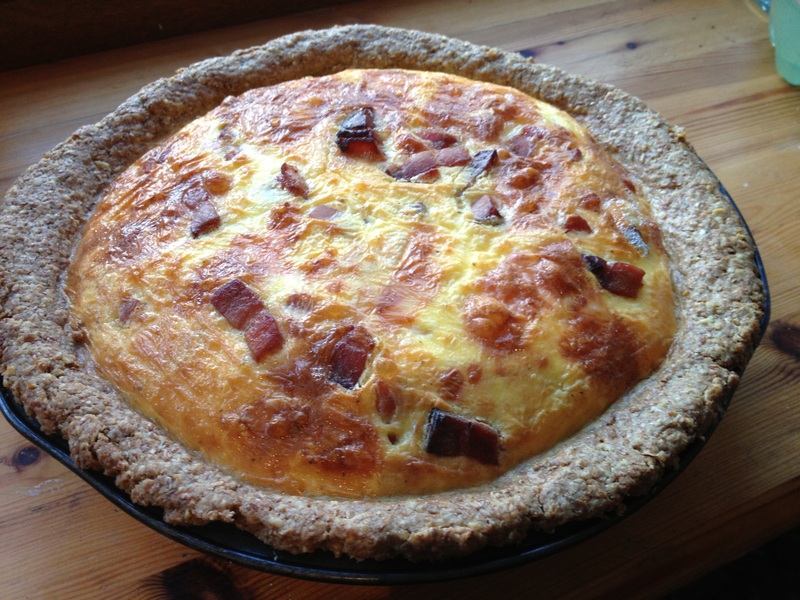 The smokiness of the pancetta and sweetness of the onions really complemented Reblochon cheese that I used in this cheesy quiche, and I was quite pleased to munch the leftovers the following day for lunch! 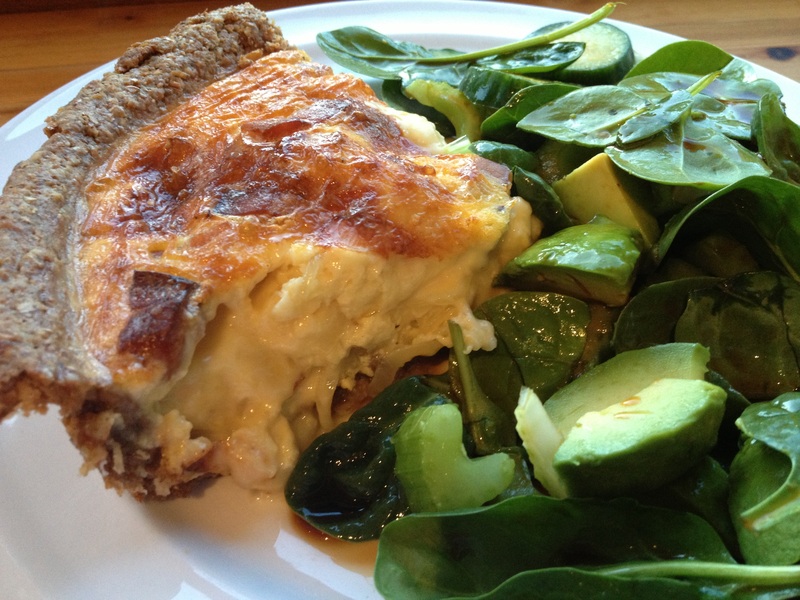 While I usually make short crust pastry the traditional way for my savoury quiches and pies, I decided to try a healthy version and stumbled upon this recipe online, which I was very happy with as despite its healthiness, it didn’t compromise the taste of the quiche at all. 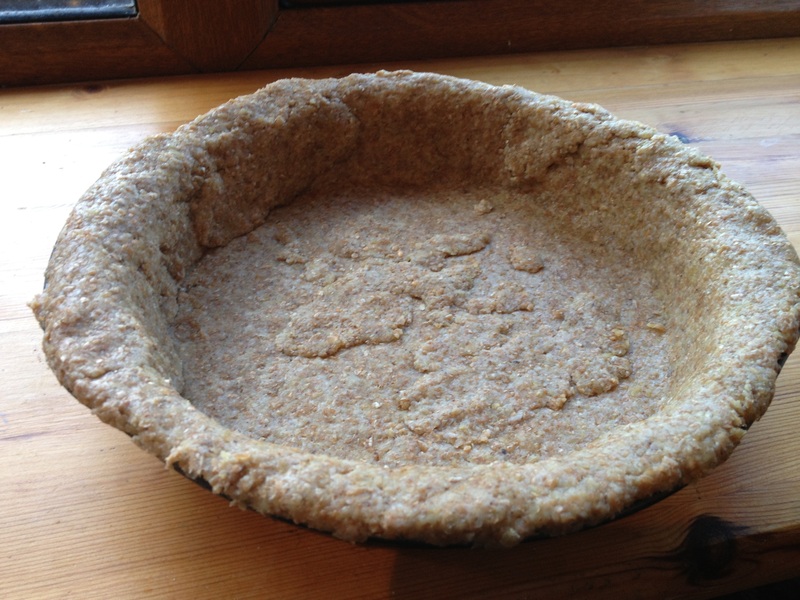 I still got the crumbly pastry I wanted, but with a more wholesome nutty finish due to using the wholemeal flour and oats. 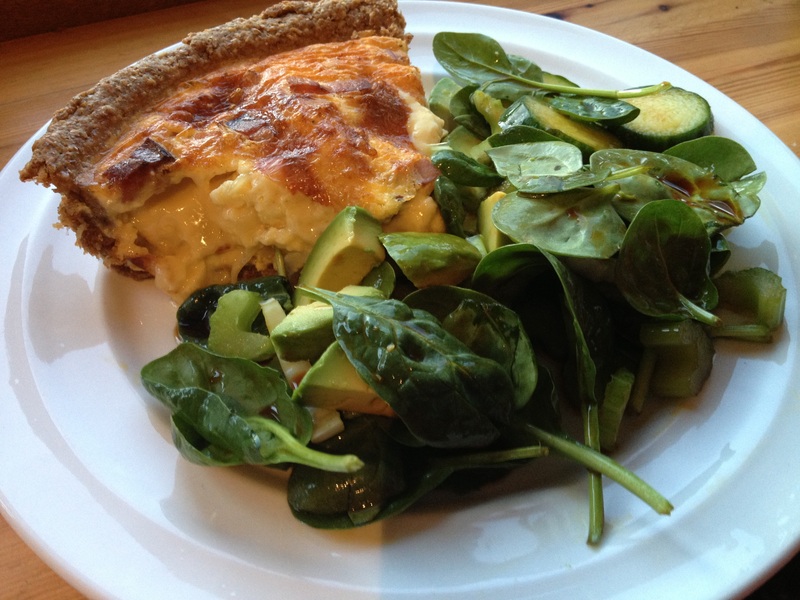 This quiche was a winner and was just as nice the next day. I recommend serving this with a nice green salad and some balsamic vinegar to balance out the cheesy, eggy indulgence of the beauty. 1. Make pastry and chill for an hour before use. If using the recipe I referenced above, don’t be dis-hearted if it doesn’t come together at first, it will after a good knead. Also if bits break away when you’re placing it in the tin, you can squish it back together in the tin- it’s a pretty malleable dough, but will still cook nice and crispy. 2. Gently fry the brown onions until soft and sweet (about 10 minutes or so). Fry pancetta in a little oil until golden. 3. 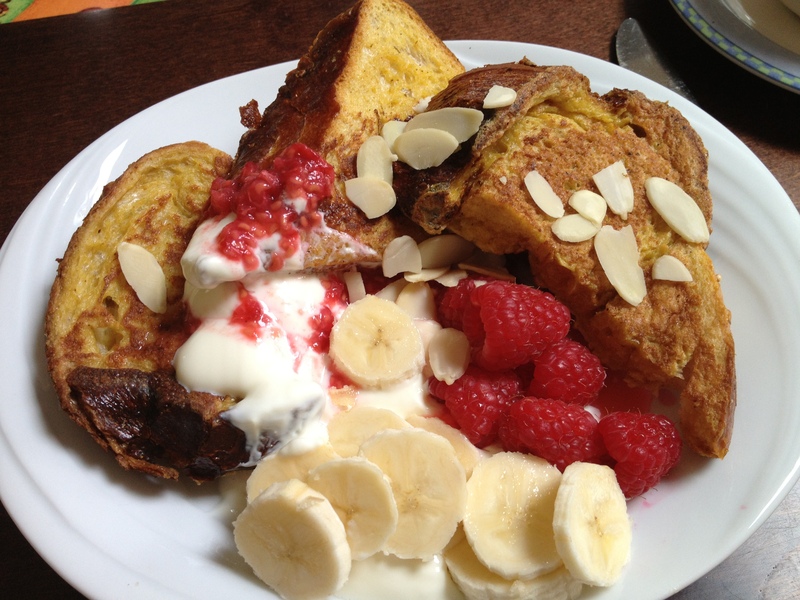 Whisk together the creme fraiche and milk until you get a consistency like thick, smooth cream. Whisk in the eggs and season with a little salt an pepper. 5. 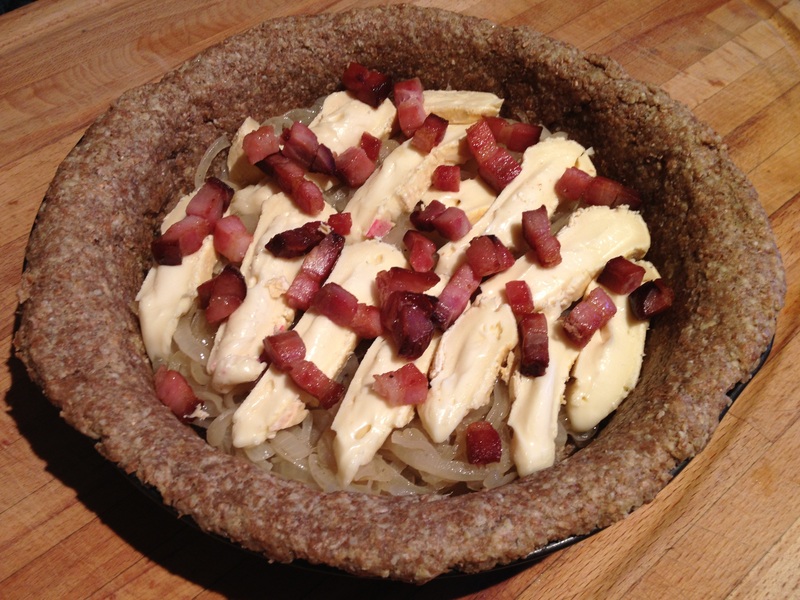 Layer the onions on top of the quiche crust, followed by the pancetta and then slices of the cheese. Pour oven the egg mix and cook in an oven at 180C for 50 minutes. 6. 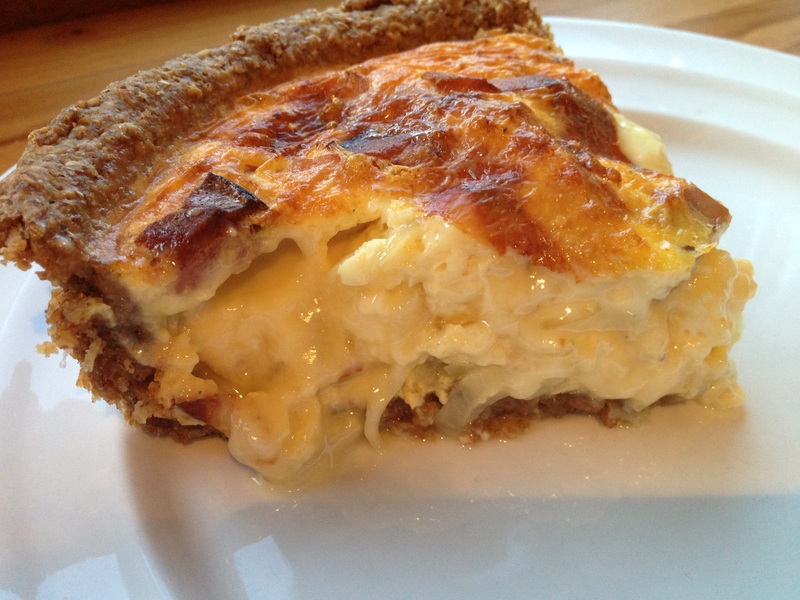 It may wobble a bit when you touch it, but this is because the melted cheese is just under the surface of the quiche, the eggs underneath should be cooked after 50 minutes. 7. 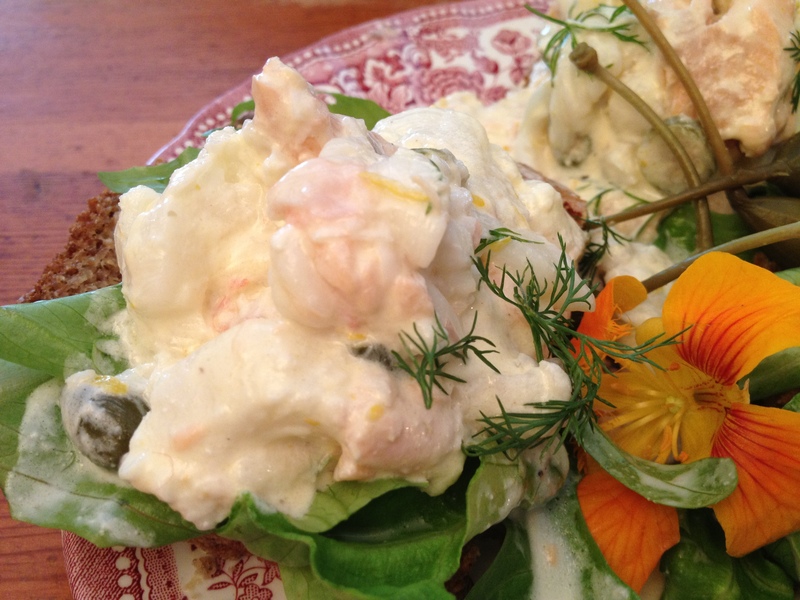 Enjoy with a salad and some balsamic vinegar. 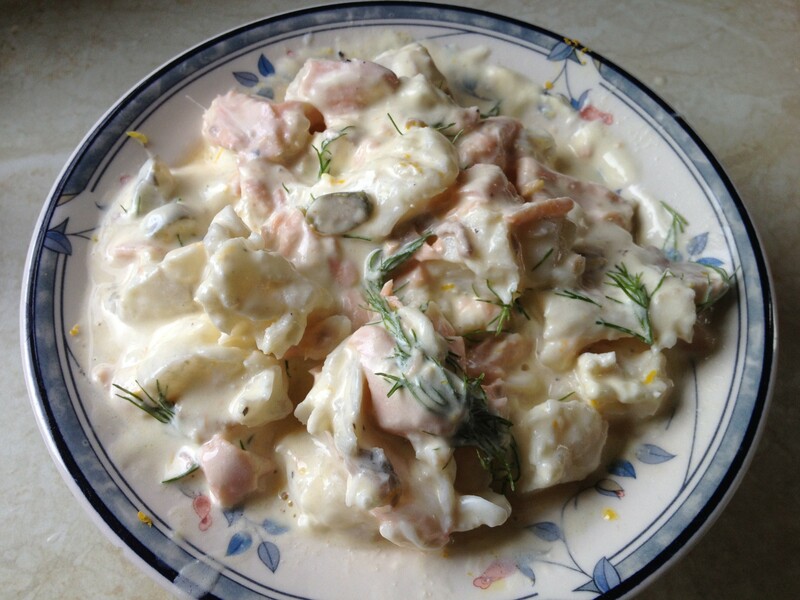 Okay this is so embarrassingly easy to make I am reluctant to call it a recipe! 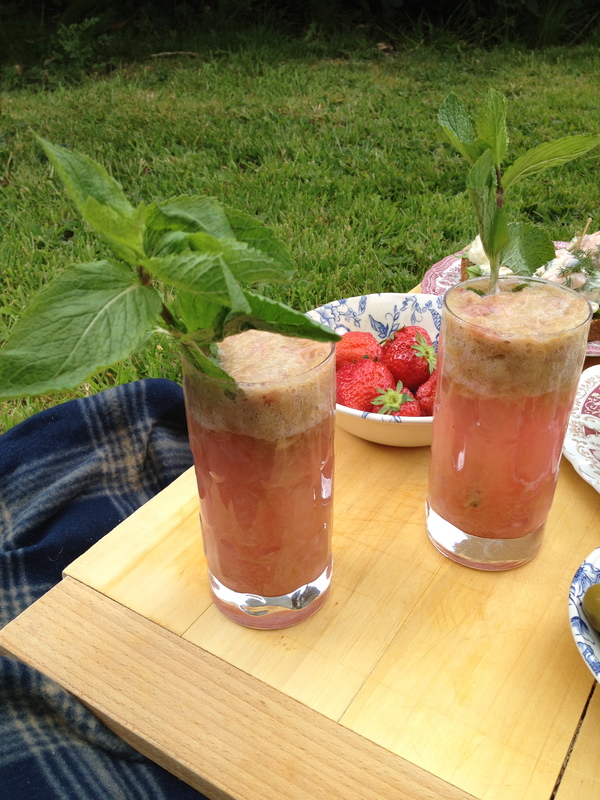 But as a result of tonnes of in-season rhubarb on shop shelves everywhere, and the idea of making a nice homemade lemonade for a picnic recently, I decided to whip this up and really enjoyed the results. Any of the leftover rhubarb can be kept in the fridge for a few days for more lemonade, or poured on your morning porridge, or used to top ice-cream for dessert. 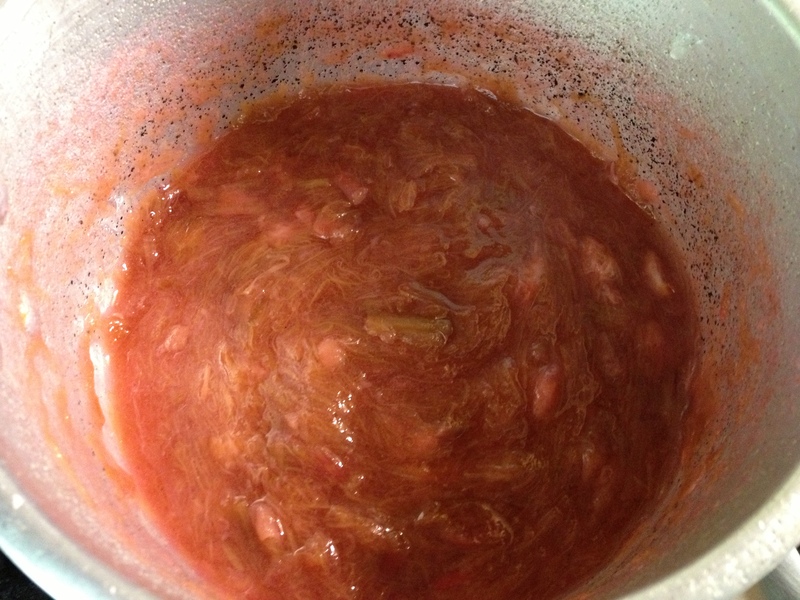 I haven’t tried freezing it, but I’m sure leftover stewed rhubarb would freeze perfectly fine for future use. This literally has three ingredients: rhubarb, sugar and water. If like me you don’t like fizzy or sugary drinks, this might be something to try for an occasional treat. It tastes delicious and is sweet but with a sharp rhubarb kick… In fact, I think I’m going to go have another glass right now! 1. 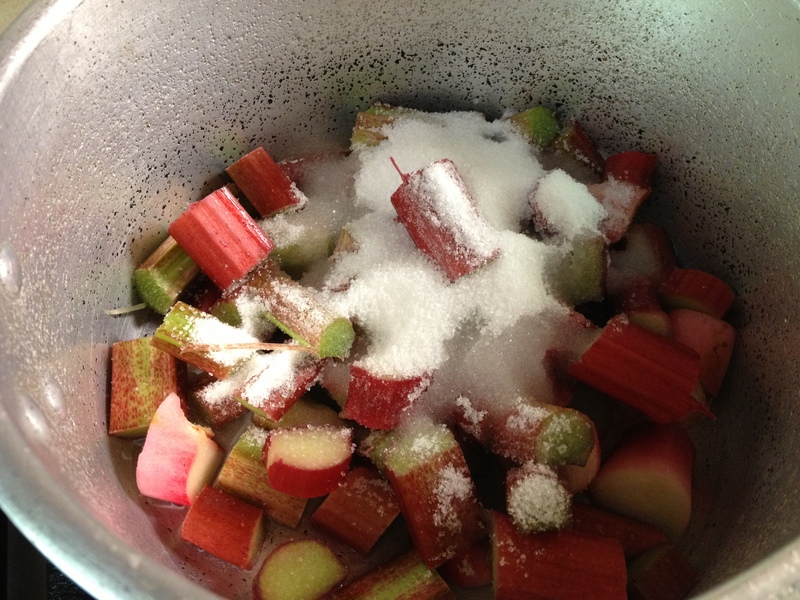 Chop up rhubarb and throw in a pot with sugar and let stew away until totally soft and turned to mush (this take about 10 minutes on a medium-high heat). You can use a fork to mash these down if you like. Let cool. 2. 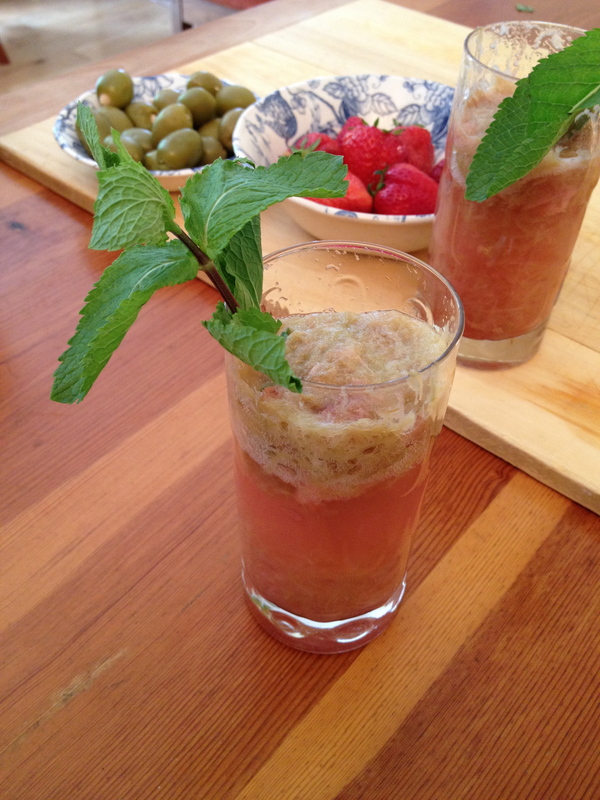 When cooled down, place 2-3 tablespoons of the stewed rhubarb in a tall glass fill it up with fizzy water (flat water works too). 3. 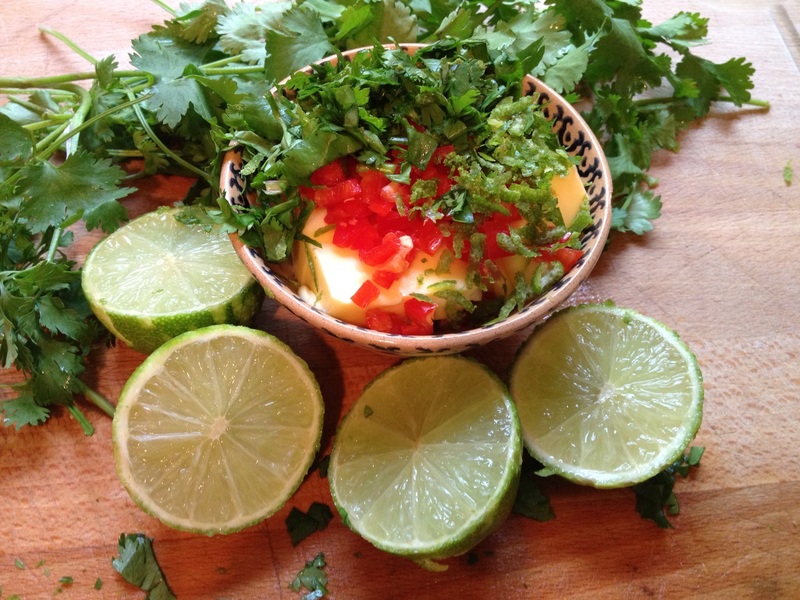 Serve with a stalk of fresh mint if you’re feeling fancy! 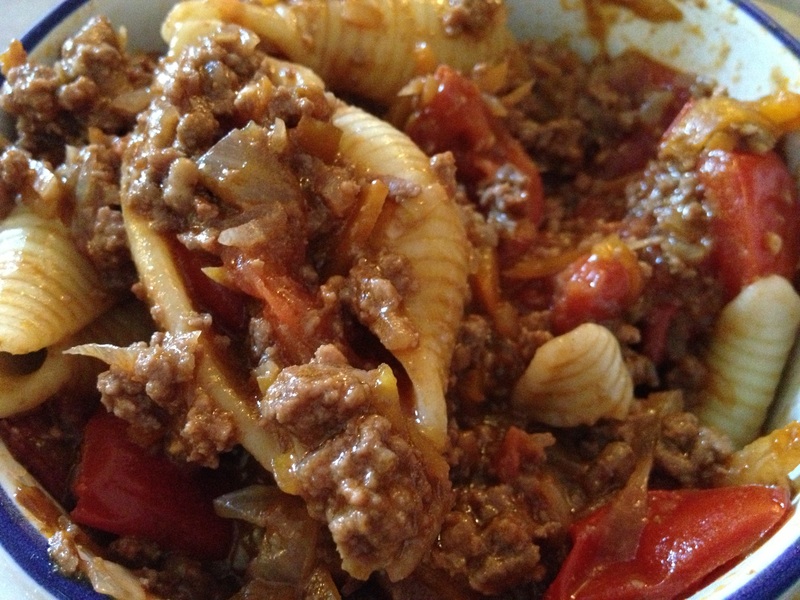 Another dish inspired my trip to Italy is an easy to make pasta dish that is packed with flavour. I decided to mimic the Italian’s way of using a few key ingredients in each dish, and resisted the urge to keep adding in more ingredients. 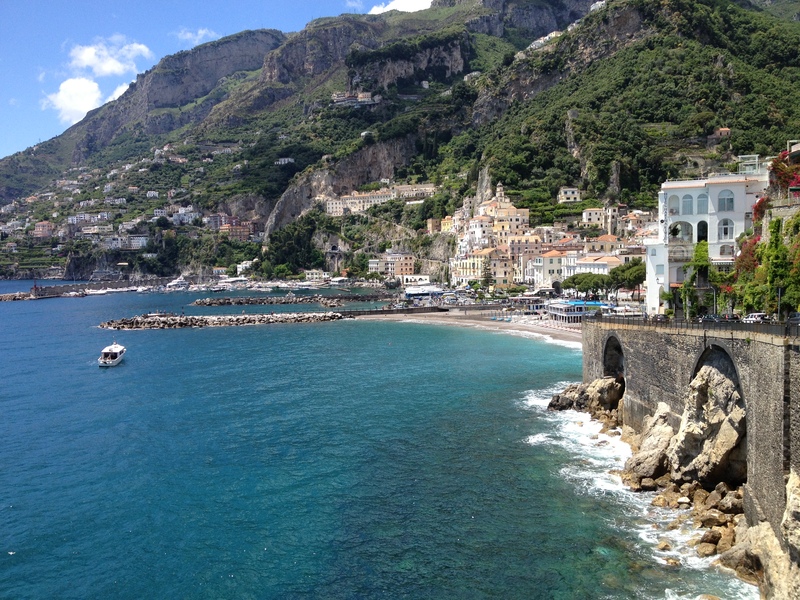 Italians use artichoke a lot in their cooking, and on the Amalfi coast they put lemons in pretty much everything as every piece of land and even smalls garden seems to have vines of plump lemons growing happily. 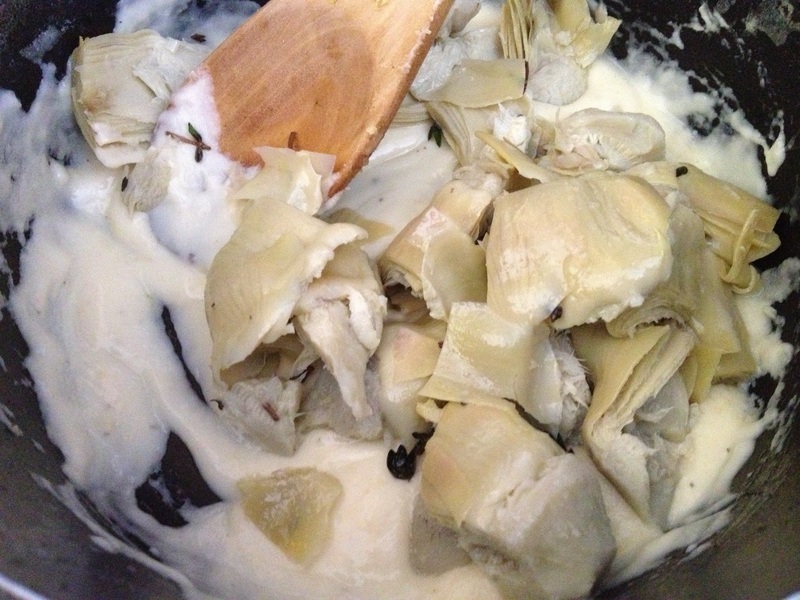 I decided to marry the two, as I think the salty artichokes cut through the sweet creamy lemon sauce perfectly. 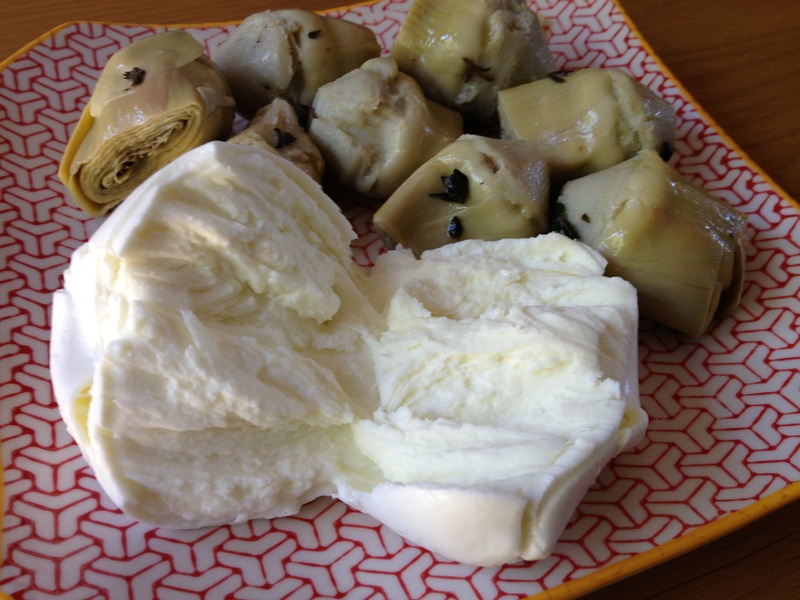 I got the artichoke hearts used for this in The Real Olive Stall at the Temple Bar market (they go to loads of farmers markets all over the country), but other good deli’s should do them, and I believe you can get them tinned and in jars too in supermarkets. This is really quick and easy, but mouthwatering and delicious. 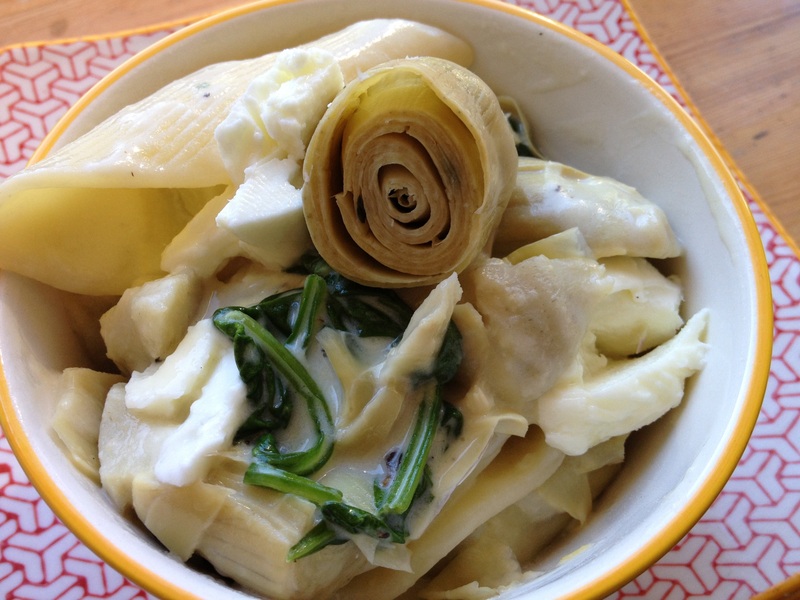 If you reserve one or two of the artichoke hearts to serve they look really impressive, like little green roses garnishing the dish. 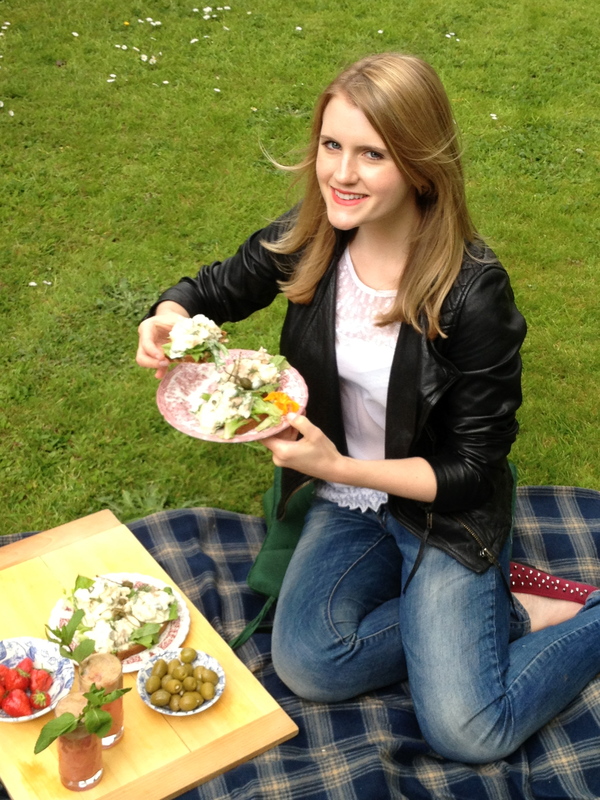 Enjoy and let me know how you get on with the recipe! 1. Pop the pasta in a pot of boiling salted water with a dash of olive oil. Cook according to packet instructions making sure to take drain when the pasta is al dente… no one likes soggy pasta. 2. Make a roux to form the base of your sauce by adding the butter and flour in a saucepan on a low heat, and stir for two minutes to cook the flour through (this gets rid of any potential flour taste and helps thicken the sauce more efficiently). Whisk in the milk and season with salt and pepper. Keep stirring all the time to prevent lumps. 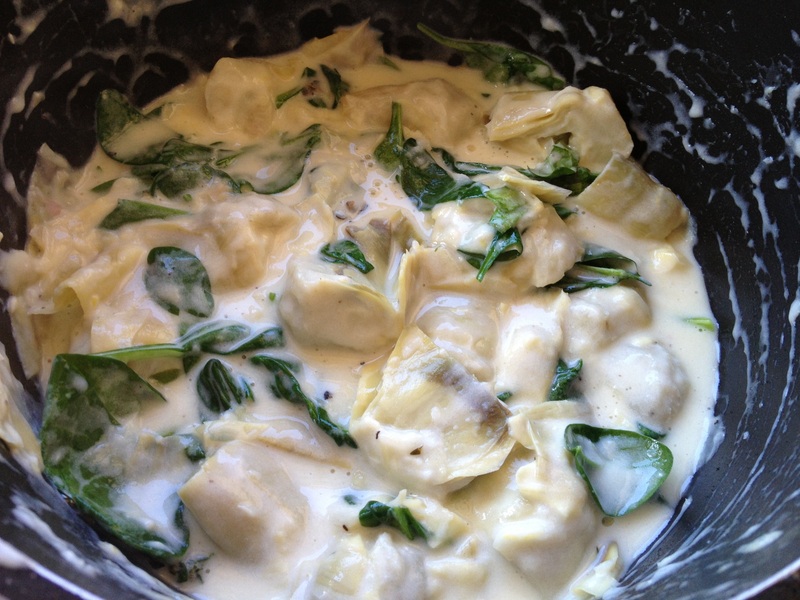 This is made very quickly, so best to start this half-way through cooking of pasta. 3. 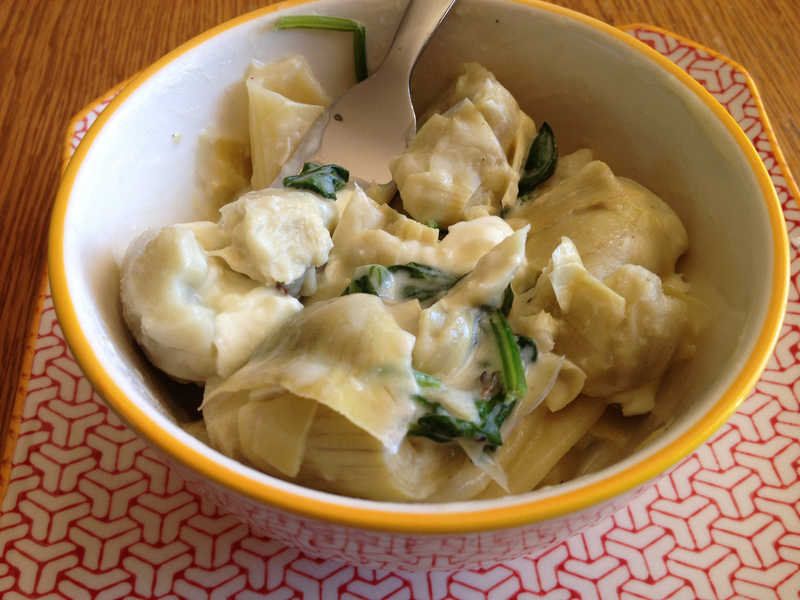 Chop up artichoke hearts into quarters, leaving two whole for serving. Add the artichoke (bar the two whole ones) to the sauce with the spinach, parmesan cheese, lemon juice and zest and stir for a few minutes until heated through. 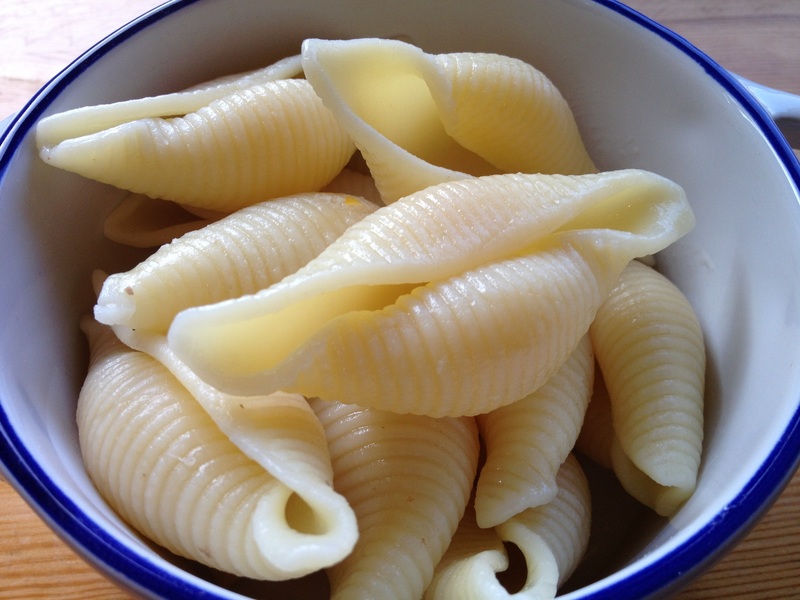 Tear up the mozerella and stir through the pasta before serving. 4. 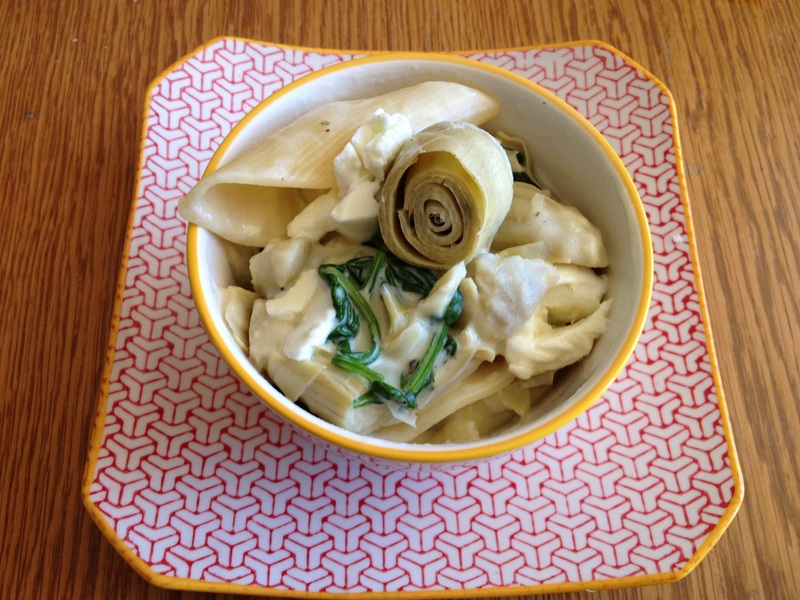 Pour the sauce over your pasta and stir through, serving with the nice pretty artichoke on top and a crack of black pepper. 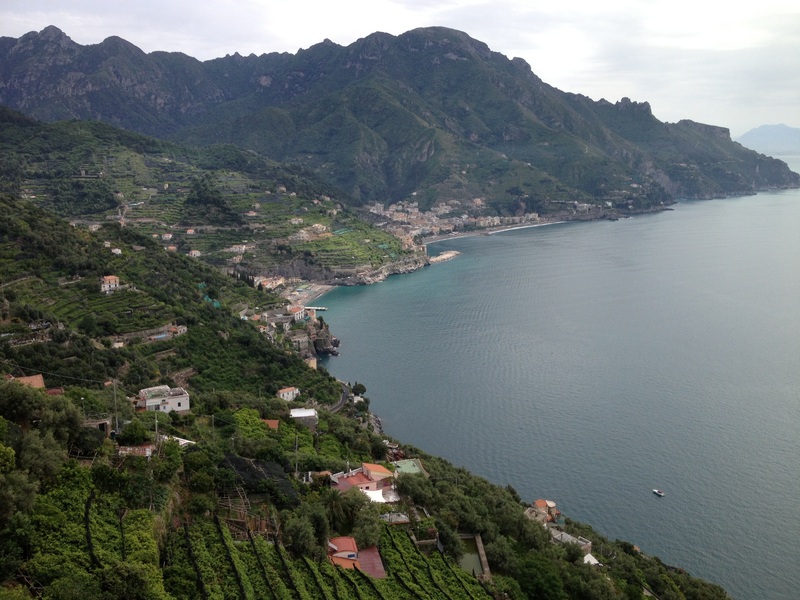 I’m just back from a week’s holidays in Ravello, Italy for my brother’s wedding and I would be lying if I told you I spent the week doing much else aside from eating good food and drinking wine. 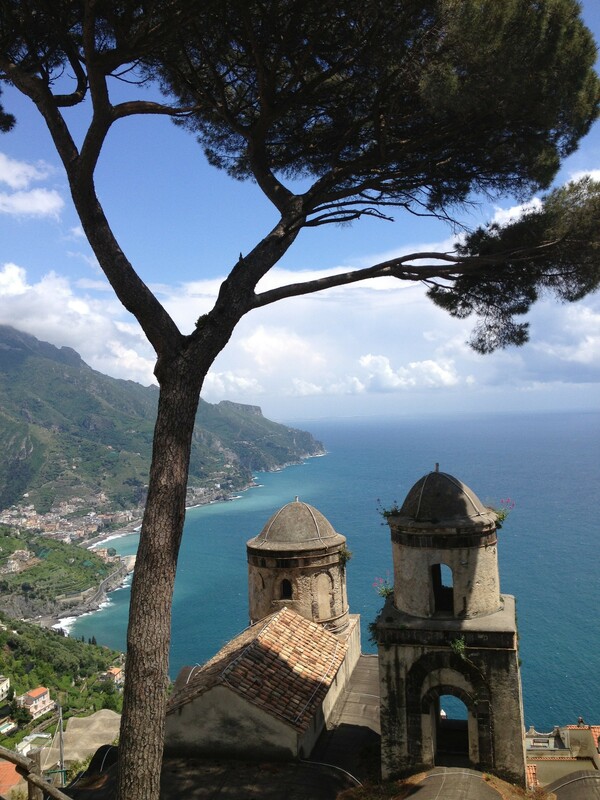 Ravello is a beautiful town on the Amalfi coast that is set up in the mountains. 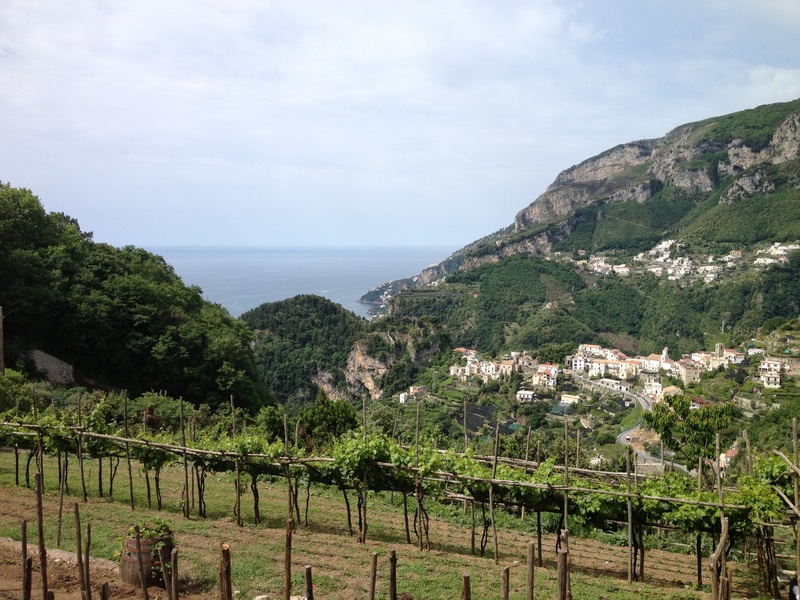 As our international family descended (as ascended as the case may be) upon Ravello we were so impressed with the food, and most of my memories of the week are spend around a table together catching up, telling stories, laughing, eating and drinking. 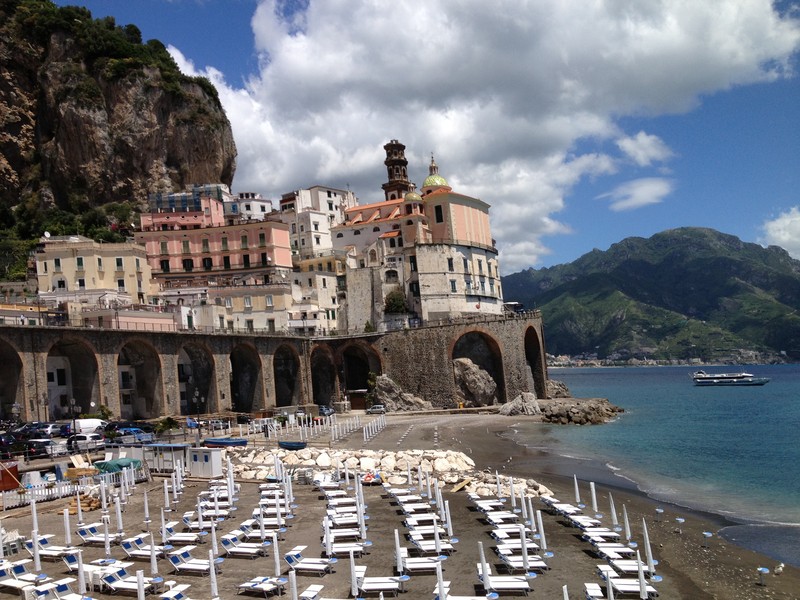 I decided to try as many classic Italian dishes as possible, and a few unusual ones that I hadn’t heard of before too. 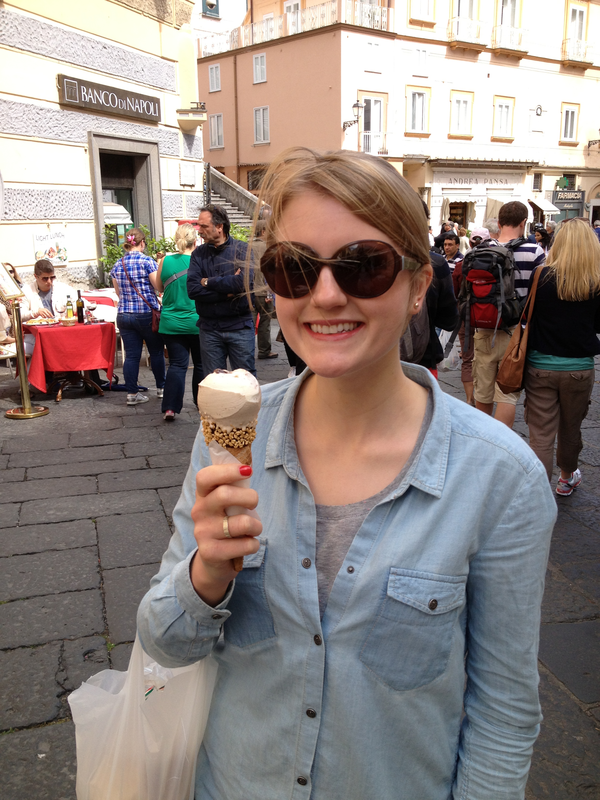 While most of us grew up eating Spaghetti Bolognese at least once a week, it turns out what we were eating is quite different to the way the Italians make it, and by quite, I mean totally different! I am going to tell you exactly how to make an authentic Italian ragu alla bolognese, and then I am going to contradict myself and proceed to break two of rules. Never ever ever use tinned tomatoes or passata- the Italians don’t use this at all, they use a few tablespoons of tomato puree, wine and stock. 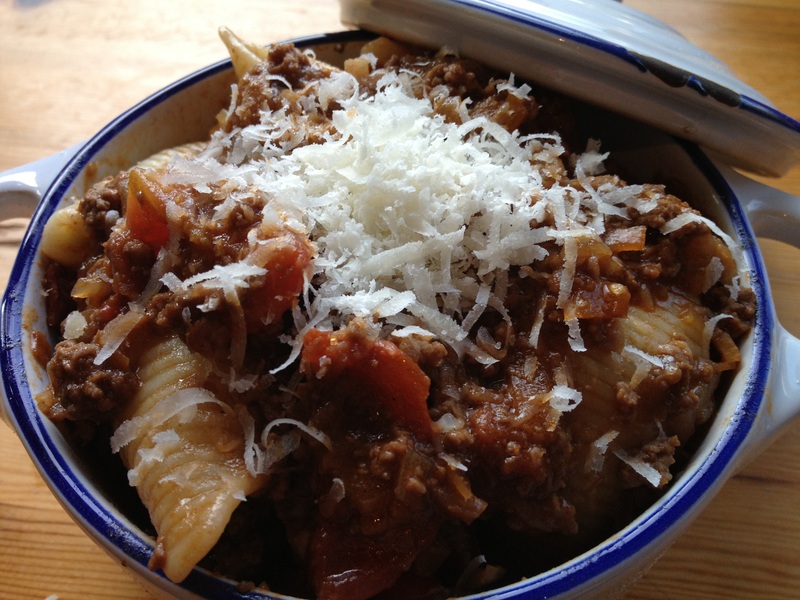 The Italians often use a mixture of beef and pork mince or pancetta in their ragu. It gives it a really nice flavour. 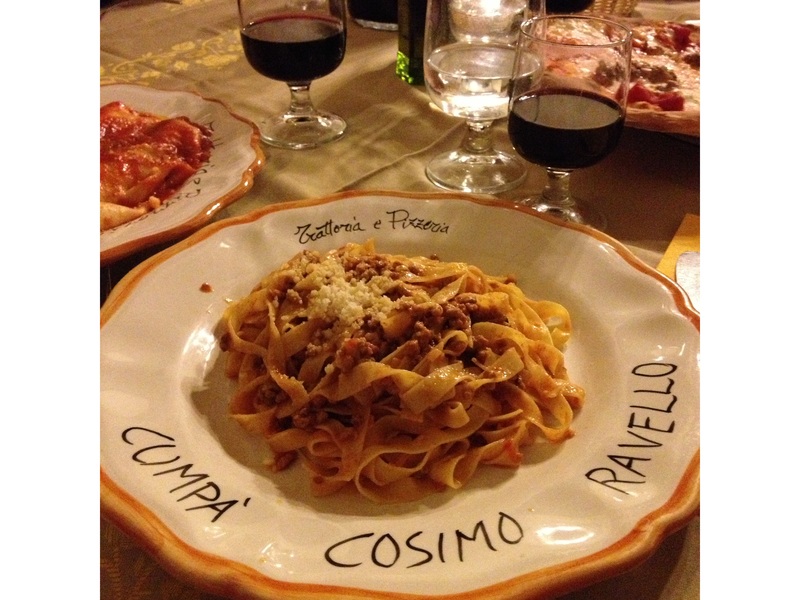 Many Italians use a glass of milk in their beef ragu to give the sauce a smoothness and lightness. 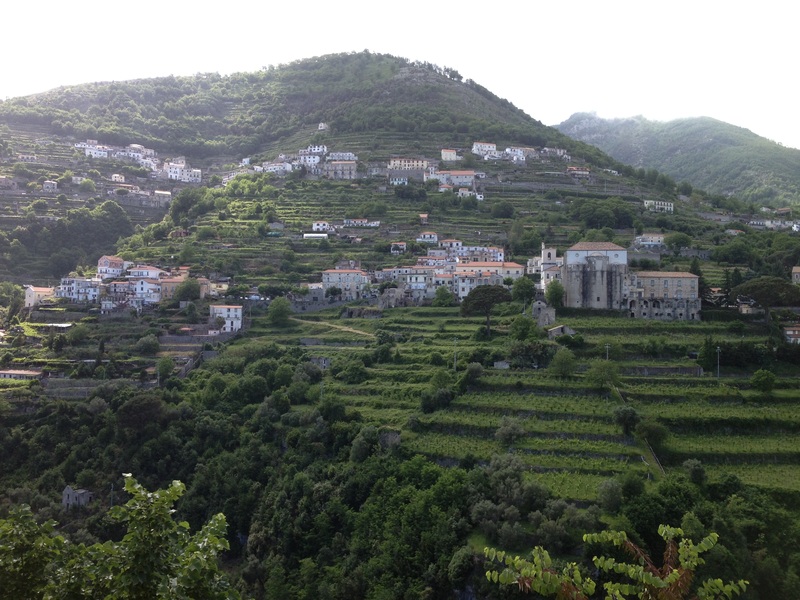 I learnt that tip from a Mama in Ravello! Give the sauce time, let it simmer away for at least and hour, but if you have time, 2 hours will turn it into a simmering pot of heaven. 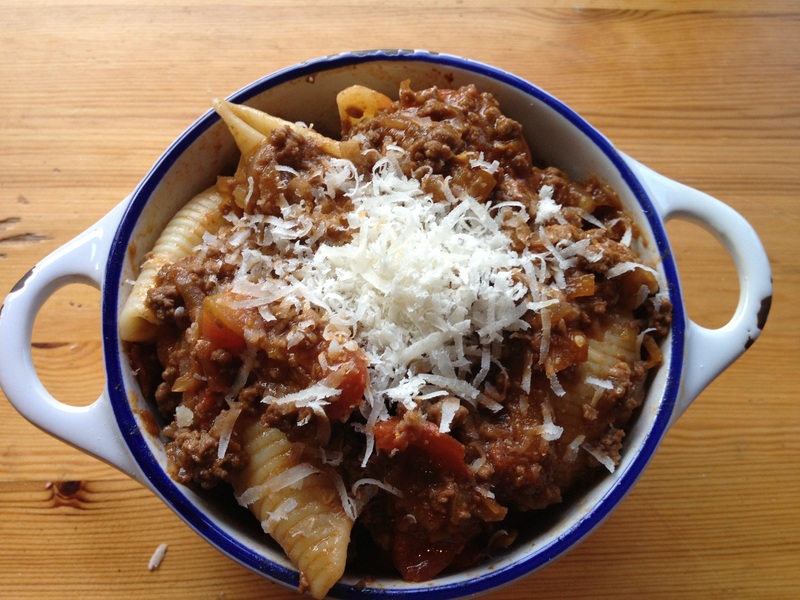 I followed these tips with slight deviation below, and made the best bolognase or ragu that I’ve ever tried to make before! Give it a go and let me know what you think! 1. Gently fry the onion, carrot and celery in a little oil on a low heat until soft. 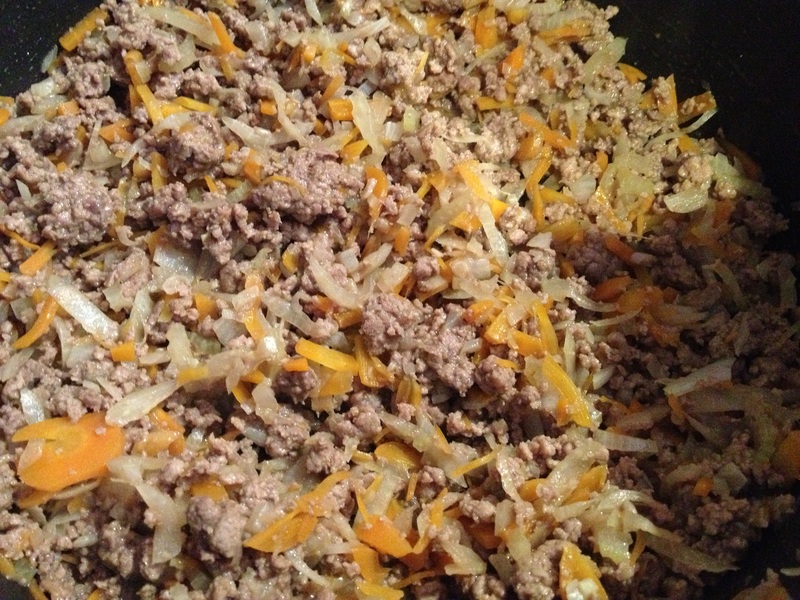 Add the mince and cook, stirring the whole time until browned. 2. When meat is browned, add a glass of red wine and stir until it has all been evaporated. Then stir in the milk, tomato puree, and most of the beef stock (save a 1/4 cup). The milk will make the sauce look really creamy, but after a few minutes of stirring and reducing it will look like a classic ragu. 3. 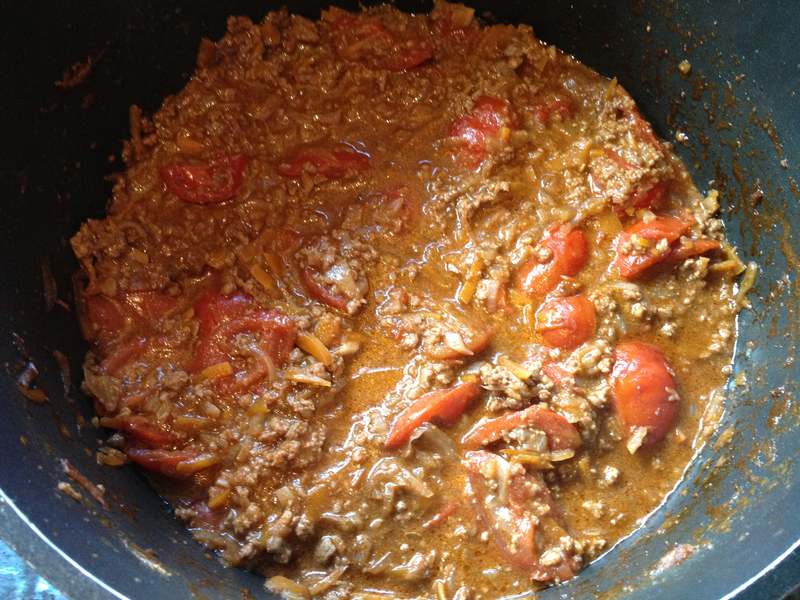 Reduce down the sauce and let your beef and pork ragu simmer away for an hour or so. Add the remaining stock towards the end if needed. 4. Cook your pasta in boiling salted water with a tbsp of olive oil until al dente. 5. Mix the pasta into the pot of sauce and serve with some parmesan cheese. Without wanting to toot my own horn, this is probably the best lunch I’ve ever made! 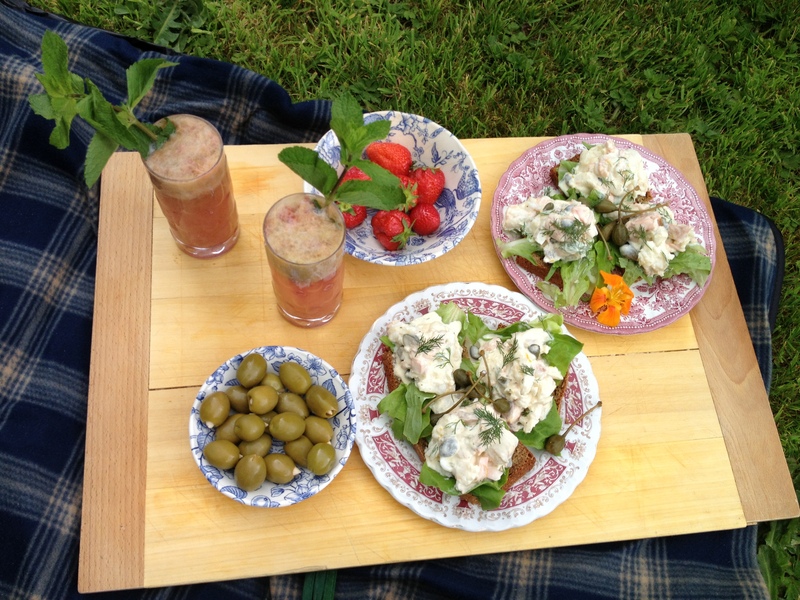 Just as well, as I was asked to write a blog for the RTE Food website, under the theme “picnic” recently and was worried my usual picnic food wouldn’t be sophisticated enough. When I was younger my family spent every summer in West Cork and rain or shine we would be on the beach every day for a swim and of course a lunchtime picnic. 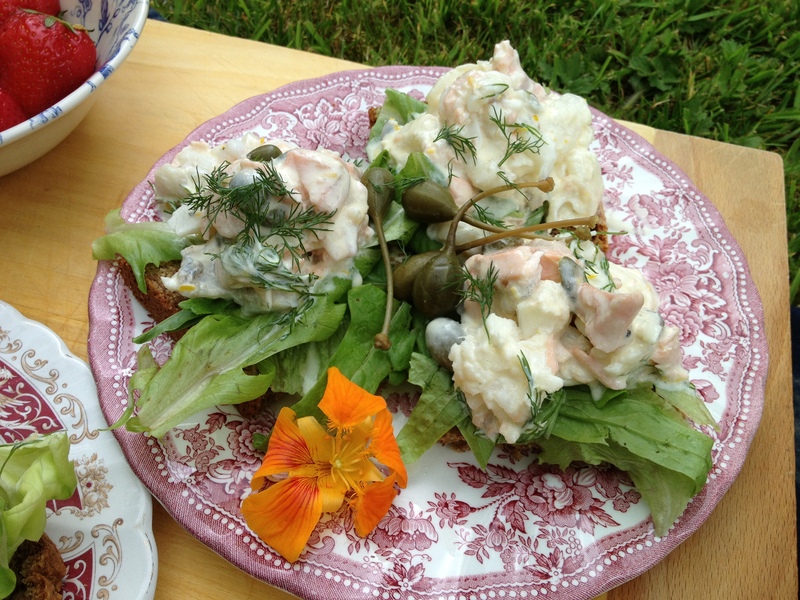 Our picnic lunches usually involved Egg Salad sandwiches which we gobbled down hungrily after hours or running around the beach and jumping in and out of the sea. I have an obsession with egg salad sandwiches, and it’s probably because of the reminders of endless, happy days spent on the beach. 1. 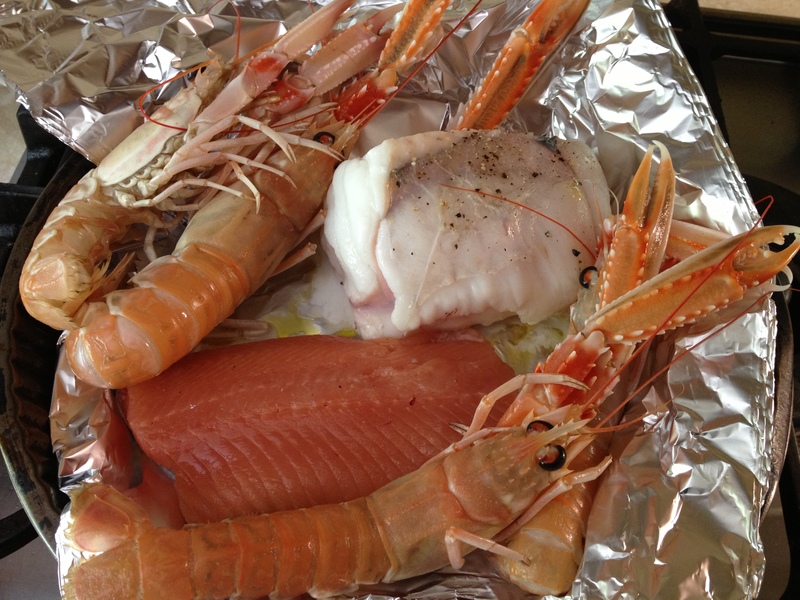 Bake your fish in an oven 180C with a little oil, salt and pepper until cooked through (about 15 minutes). I put on the monkfish first for 5-7 minutes as it was a much thicker piece and takes longer to cook. 2. 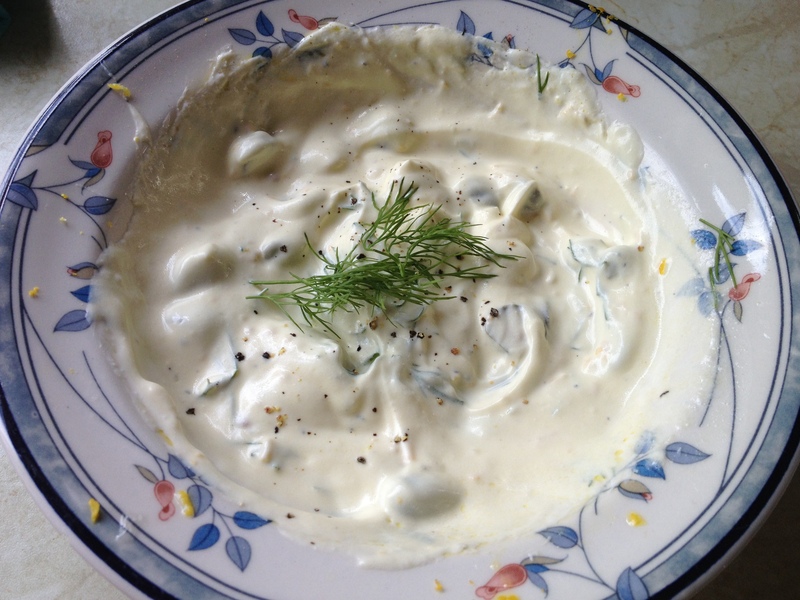 For the sauce mix together the creme fraiche, lemon juice, lemon zest, oil, capers, chopped dill and season with salt and pepper. 3. Flake or chop the fish into bite-size pieces and stir into the sauce. 4. 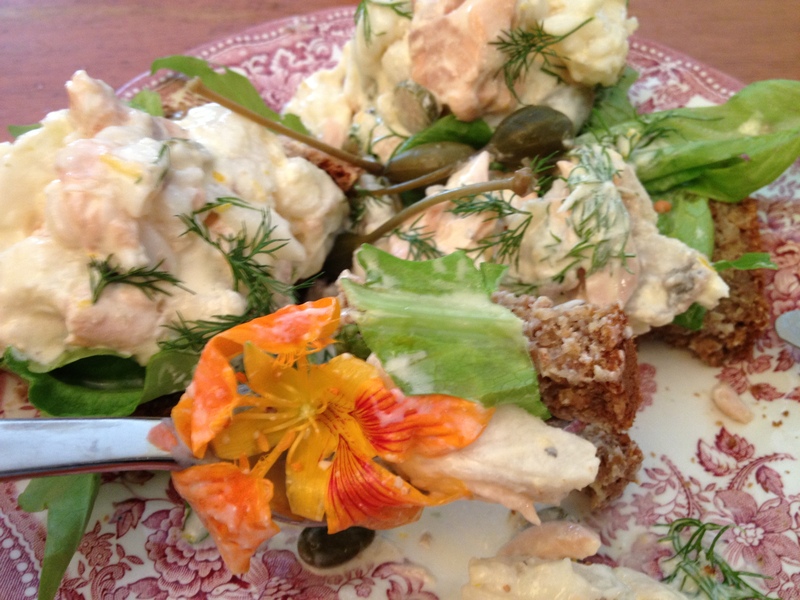 Serve the fish mix on brown bread and lettuce with a squeeze of lemon juice on top and a garnish of capers and dill. Enter your email address to follow The Rebel Kitchen and receive notifications of new posts by email.